Happy Taco Tuesday everyone! 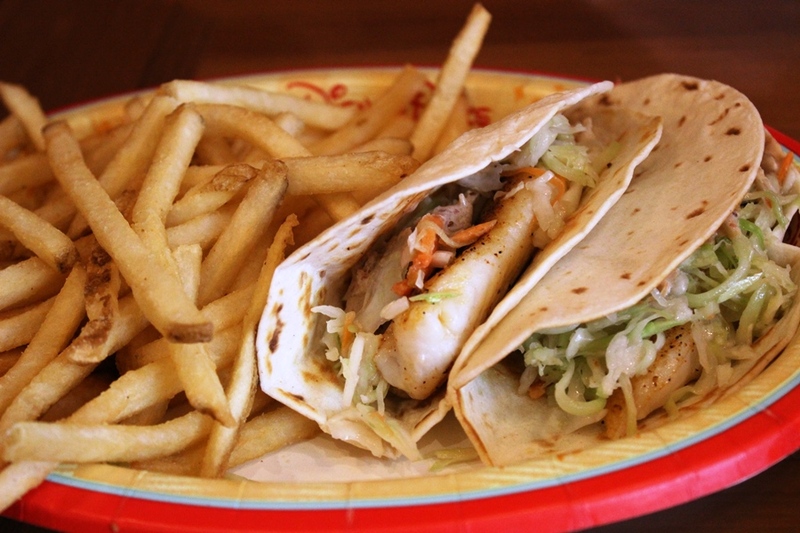 There are a lot of taco options in Walt Disney World, but today we’re going to double up on an order of fish tacos. We’ll start on the shores of the Seven Seas Lagoon before venturing off to one of our favorite watering holes in Disney Springs. The Seven Seas Lagoon could lead us to many locales, but if we’re looking for fish tacos, then we could only wash up on the beach of the Polynesian Village. To be more specific, we’re headed in to Capt. Cook’s for the handily named Fish Tacos. This dish includes a generous portion of the fish of the day, blackened, and then placed on a flour tortilla. It is topped with broccoli slaw and served with French fries. The blackened spices come across as having a distinctly Latin flavor, and provide the fish with a nice kick. While a mayonnaise based slaw is not the typical trimming for such a dish, the broccoli slaw does a nice job with the fish. The slaw is crunchy and brings some new flavors to the party, especially the bitter cabbage type flavor present due to the broccoli. The flour tortilla is nothing special, but does an admirable job of holding the taco together. If anything seems out of sorts with the Fish Tacos, however, it is the side dish of fries. I have nothing against fries as a general rule, but they just seem a bit lost with being included here. Some fresh fruit or couscous seems like a more complimentary addition. Let’s head down to Disney Springs, and if you haven’t guessed by now that I’m headed for Jock Lindsey’s Hangar Bar, then shame on you! 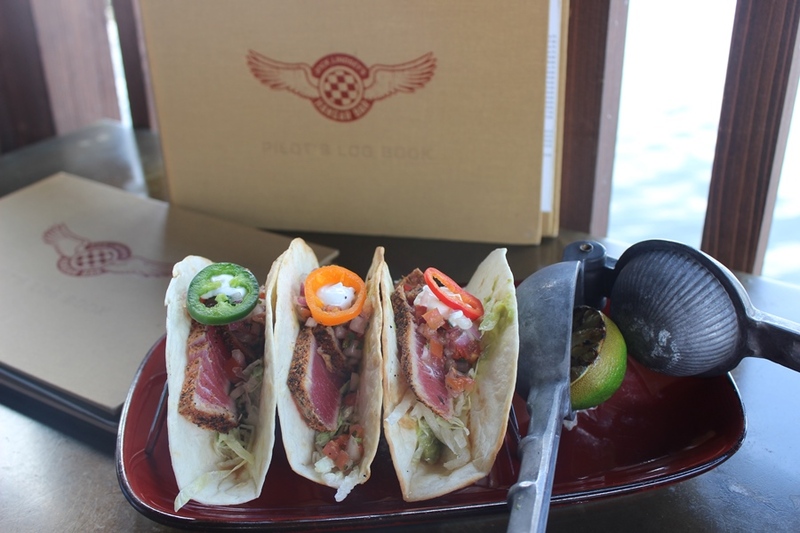 We’ve sung the praises of the Hangar Bar many times over the past year, but today we’ve ventured deep into the menu to procure the Lost City Specialty, the Tanis Tuna Tacos. This trio of tacos starts with a freshly prepared tortilla shell. Seared Ahi tuna, that has been prepared with ancient spices we’ve been told, is next to be added. To the tuna is added Pico de Gallo, cilantro, lettuce, sour cream, guacamole, and each is topped with a different colored slice of jalapeno pepper. On the side is a freshly toasted lime, complete with juicer. The sear on the tuna is top notch, making certain that the fish is not overcooked, and the spices bring out the wonderful mild and buttery flavors of the tuna. The ancient spices add some heat and give these tacos a sense of place we’re not typically used to with fish tacos. The typical taco toppings of Pico de Gallo, lettuce, guacamole, and sour cream are nice, but aren’t wow factors. The tortilla is puffed up giving it just the right amount of chewiness and crispiness. The real stars however, are the tuna and the toasted lime. Combining the Ahi tuna with the warm flavors of the lime is an amazing duo. Both tacos deserve to be part of any Taco Tuesday, or maybe a Fish Friday? Either way, Capt. Cook’s and Jock Lindsey’s Hangar Bar have put together to excellent fish taco dishes. If I had to pick just one, the Hangar Bar’s Tanis Tuna Tacos are far and away some of the best fish tacos I’ve seen anywhere, so I would definitely give them a nod. Whichever you choose, you’re definitely off on a culinary adventure!